The Union Cabinet chaired by Prime Minister Shri Narendra Modi has approved the Agriculture Export Policy, 2018. The Cabinet has also approved the proposal for establishment of Monitoring Framework at Centre with Commerce as the nodal Department with representation from various line Ministries/Departments and Agencies and representatives of concerned State Governments, to oversee the implementation of Agriculture Export Policy. The Government has come out with a policy to double farmers’ income by 2022. Exports of agricultural products would play a pivotal role in achieving this goal. 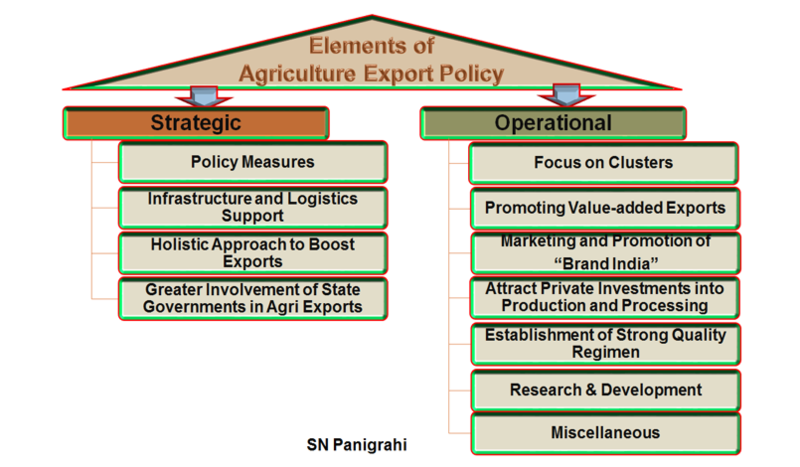 In order to provide an impetus to agricultural exports, the Government has come out with a comprehensive “Agriculture Export Policy” aimed at doubling the agricultural exports and integrating Indian farmers and agricultural products with the global value chains. Policy Measures: Discussions with public and private stakeholders across the agricultural value chain highlighted certain structural changes that were required to boost agricultural exports. 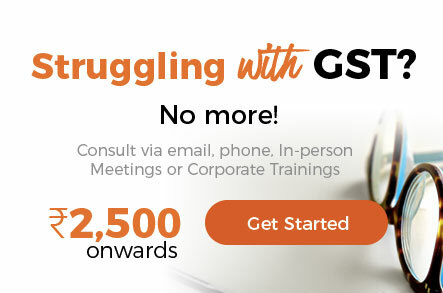 These comprise of both general and commodity specific measures that may be urgently taken and at little to no financial cost. The subsequent gains, however, are aplenty. Providing assurance that the processed agricultural products and all kinds of organic products will not be brought under the ambit of any kind of export restriction (viz. Minimum Export Price, Export duty, Export bans, Export quota, Export capping, Export permit etc.) even though the primary agricultural product or non-organic agricultural product is brought under some kind of export restrictions. Identification of a few commodities which are essential for food security in consultation with the relevant stakeholders and Ministries. Any export restriction on such identified commodities under extreme price situation will be based on decision of a high level committee. Also, any kind of export prohibitions and restrictions on the identified commodities above would be taken up in a WTO compatible manner. 3). Liberalised import of agricultural products for value addition and re-export. Presence of robust infrastructure is critical component of a strong agricultural value chain. This involves pre-harvest and post-harvest handling facilities, storage & distribution, processing facilities, roads and world class exit point infrastructure at ports facilitating swift trade. Mega Food Parks, state-of-the-art testing laboratories and Integrated Cold Chains are the fundamentals on which India can increase its agricultural exports. Given the perishable nature and stringent import standards for most of the food products, efficient and time-sensitive handling is extremely vital to agricultural commodities. 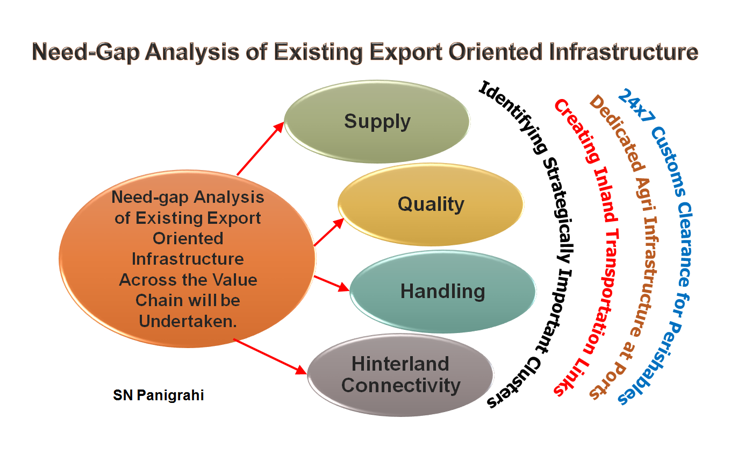 A comprehensive need-gap analysis of existing export oriented infrastructure across the value chain will be undertaken. Identify major ports where current/projected bulk and container agri traffic demands infrastructure and modernization initiatives. 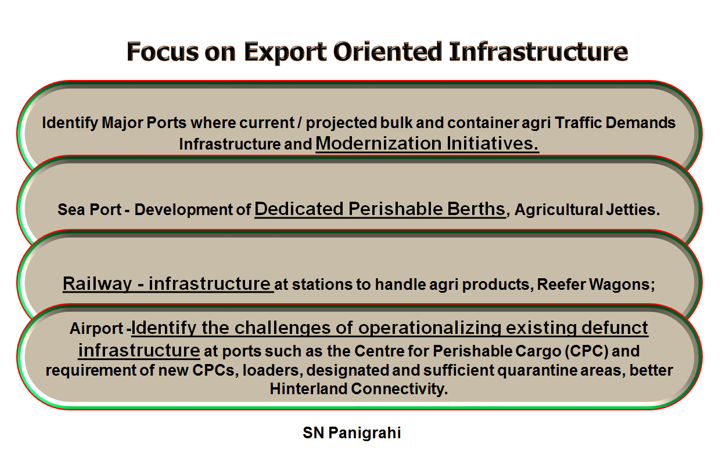 Airport -Identify the challenges of operationalizing existing defunct infrastructure at ports such as the Centre for Perishable Cargo (CPC) and requirement of new CPCs, loaders, designated and sufficient quarantine areas, better Hinterland Connectivity. Subject to successful implementation of these clusters, a transition to Agri Export Zones (AEZs) could be thought of to facilitate value addition, common facility creation and higher exports from such zones. The measures towards setting up and functioning of the AEZs would be taken up in WTO compatible manner. Special Economic Zones (SEZ) facilitate production of goods at a comparatively lower price for exporters aiming to be globally competitive. India has many successful SEZs established in Public and Private sectors in specific sectors like IT, Textiles, Pharmaceutical and some being multi sectoral. There are opportunities for developing Agriculture Export SEZ mainly aimed at producing value added agriculture commodities for certain countries which are largely dependent on import of agriculture products. The interest of some countries (having substantial gap in domestic availability of grains, vegetables and fruits) can be explored for bringing in Foreign Direct Investment (FDI) into Agriculture Export SEZ in order to ensure food security of that country. There can be complete buyback arrangements by the countries which are bringing in FDI thus providing a stable market for Indian exports. Attract private investments in export oriented activities and infrastructure. Developing sea protocols for perishables must be taken on priority for long distance markets. Export of perishables requires special storage, transportation and handling at desired temperatures. Time is a major constraint and air freight proves costly for exporters while low volumes and poor infrastructure make it unviable for airlines to transport produce. However, India’s export of fresh produce can grow exponentially if sea protocols are established across exported/exportable varieties of shortlisted commodities. A sea protocol will indicate at what maturity level harvesting can be done for transportation by sea. Entrepreneurs are to be supported to start a new venture in Agri products exports during their initial period of establishment. A start-up in the Agri export sector, which is going to work on a new concept / product / project may submit its proposals. All such proposals would be referred to the fund manager for its evaluation and provide funding for the deserving proposals which are going to aid in increasing agricultural exports from the country. For e.g. use of IT in the agriculture value chain including precision farming, plant health monitoring, use of drones for precision agriculture, packaging, tracking of produce in transit may be supported by the Fund. 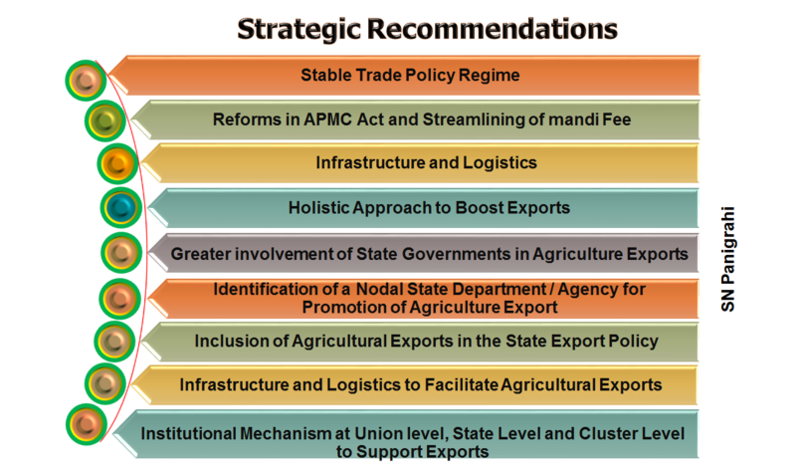 The Policy aims at addressing a whole range of issues which could potentially propel India into the top bracket of agricultural exports. It has often been recognized that integration in the global value chain is one of the most certain methods of adopting the best agricultural practices along with attaining productivity gains and cost competitiveness. The objective of doubling the farmer’s income will invariably require high levels of income as well as improving in the food value chain. 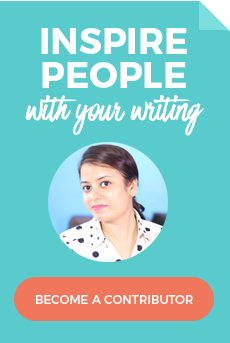 Disclaimer : The views and opinions; thoughts and assumptions; analysis and conclusions expressed in this article are those of the authors and do not necessarily reflect any legal standing.